Friendly interface allows you to perform lots of different operations in easy way. You can use it to record your own music, voice or other audio, edit it, mix it with other audio or musical parts, add effects like Reverb, Chorus, and Echo, and master it so that you can burn it to a CD, post it on the World Wide Web, or e-mail it. 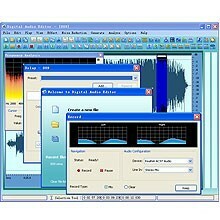 Digital Audio Editor supports all major audio file formats. Digital Audio Editor will be interesting for professionals and amateurs, it is very easy to use, it enables you to perform a lot of operations without any difficulties. Once you get started you will be surprised to see the possibilities this program offers to you. So what are the main functions of Digital Audio Editor? Suppose you have recorded some audio data, now you can do whatever you want with it: cut it, copy, paste, move, the same operations that you can do with the text in a word processor. In case you make a mistake, press Undo button, and try again. Digital Audio Editor has a great variety of audio effects and tools: Echo, Delay, Flanger, Reverb, Phaser, Quick Filters, FFT Filter, Amplify and many others. With the help of Digital Audio Editor you can also analyze your audio data. Waveform View, Spectral View are at your disposal. It provides an intuitive, easy-to-use interface and is designed for the everyday user. You don't need to be a professional to use Digital Audio Editor! Nero Burning ROM - Nero Burning ROM 2019 burns, copies, rips, and protects your multimedia files for the long term with unbeatable quality and reliably blocks undesired glances thanks to the new SecurDisc 4.0 technology. Switch Plus Edition - Switch Plus is a sound file converter for Windows. It can convert mp3, wav or wma format and more to the audio format of your choice. FoneEraser - Aiseesoft FoneEraser is the most powerful security tool to preserve your privacy through erasing sensitive data or all other data on the iPhone/iPod/iPad. You can select the erasing level and remove the data from your iPhone and iPad simultaneously. Aiseesoft Mac FoneLab - Aiseesoft Mac FoneLab can recover lost and deleted data on Mac from iPhone XS/XS Max/XR/X, iPad mini 2, iPad Air and iPod without iTunes backup. Moreover, it can easily help you regain lost data from iTunes backup for all iOS devices. Any Audio Grabber - Soft4Boost Any Audio Grabber is intended for saving audio tracks from audio discs to computer in different audio formats. Now you don't need other converters as Soft4Boost Any Audio Grabber supports most of all known audio formats. Tunesbro DiskGeeker - It can fully recover all kinds of deleted files from hard drive, SSD, USB drive, camera memory or SD card. It runs fast and 100% safe to use.